With CES only a week away, photos and incomplete specs for 8 new machines from HP have leaked, including an upgraded Mini 210 HD netbook now touting a N450 Pine Trail processor. 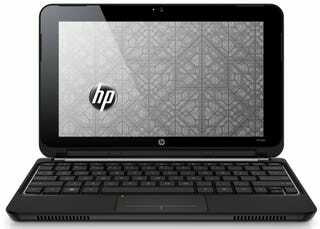 The HP Mini 210 HD, to be officially announced next week, boasts a 1.66GHz N450 Atom CPU and GMA 3150 graphics. The N450 is half as small as and nearly 20% more efficient than its predecessor. The HD designation will likely come courtesy of Broadcom's Crystal HD video chip.